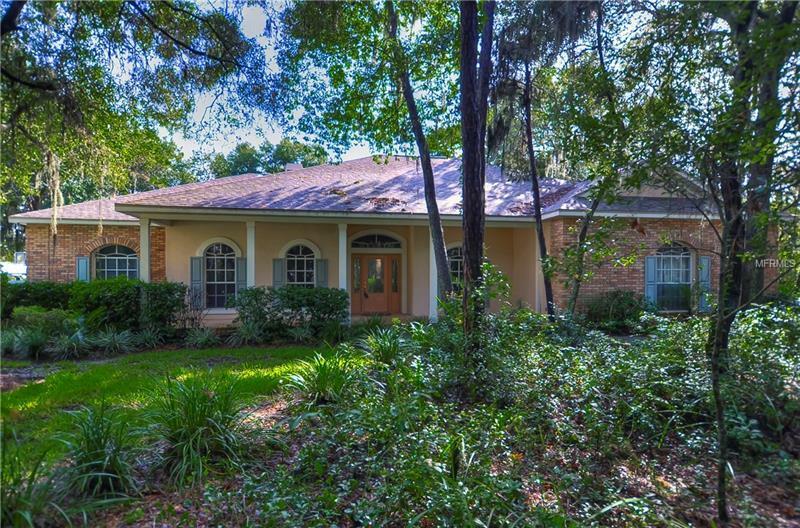 Southern Charm home w/private pond views & beautiful elevation on over half acre w/wooded Florida friendly landscape designed to reduce irrigation bills! Just imagine sitting on your front porch on peaceful evenings chatting w/neighbors! Better yet, invite them into your beautiful home featuring open floor plan w/gorgeous 12foot ceilings, Bast true hardwood floors, upgraded moldings, oversized baseboards, trim & plantation shutters! Great room w/fireplace opens to lovely kitchen w/updated appliances & 42inch WHITE cabinets. Oversized dining & formal living rooms offer flexibility for entertaining or use one as a study. One bedroom was converted into oversized study but could easily be changed back to bedroom w/private bath just steps away. Two more large bedrooms & bath on this split plan offer great closet space. Secluded master suite boasts hardwood floors & private escape to beautiful brick paver pool & spa for late night swims! Terraced pool & spa are centerpiece of wonderful outdoor living w/pond just beyond the fenced in yard. Amazing lanai/porch space...a true outdoor oasis, surrounded by private, peaceful nature. Did I mention the fabulous bonus room? This space could be a wonderful in-law suite w/private bath & its own exit to lanai! This house truly has it all! Great indoor space, 4/3/3 car garage, NEW ROOF & NEW INTERIOR NEUTRAL PAINT, private corner lot, incredible outdoor living & curb appeal in sought after Fish Hawk Trails, w/parks, playgrounds, tennis, miles of trails & manned guard gate!